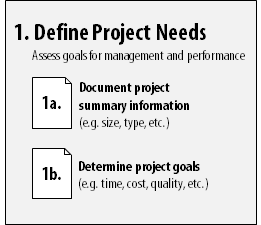 The main finding of this research was that project delivery methods alone (i.e. design-bid-build, construction manager at risk, design build, integrated project delivery) did not determine success. Instead, the most successful projects follow distinct delivery strategies. In particular, those strategies that align the core project team—owner, designers, primary builder and key specialty trades—are more effective in meeting or exceeding their cost, schedule and quality goals. 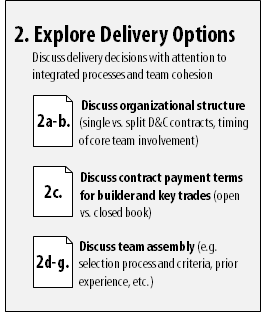 Best leveraged in a workshop setting, the steps below outline the process for selecting a delivery strategy that meets the needs of your project. To learn more or to get started, please download the full guide and workshop templates! Assess the project scope and specific goals for the successful design and construction of your facility. Goals should reflect the desired building system performance, as well as project management expectations for budget, schedule and quality of construction. Discuss opportunities and obstacles for structuring design and construction services on your project. The stakeholders should identify their preferences related to the organization of the core project team, the payment terms within the construction contracts and the procurement process for assembling core project team members. Convert stakeholder preferences into actionable decisions that enable a successful delivery strategy. First, identify any cultural or policy constraints which limit your options for delivering the project. 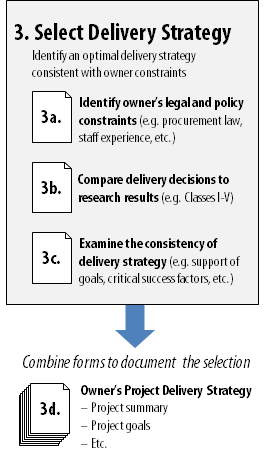 Next, compare the stakeholder preferences from Step 2 with the five distinct delivery strategies found in this research. Reflect on the consistency of the stakeholder preferences and discuss how they might be implemented as part of your project delivery strategy. Lastly, identify several specific tactics for improving participation in integrated practices and building cohesion within the core project team. This project is sponsored by The Charles Pankow Foundation and the Construction Industry Institute. We appreciate their generous support.